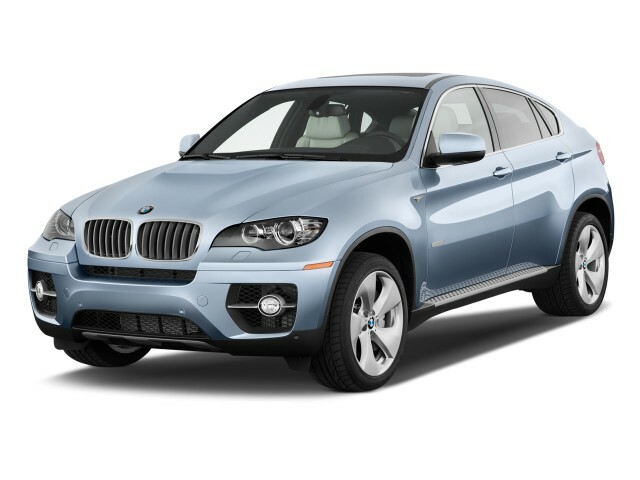 TheCarConnection.com's researchers scoured the Web and extracted the key information from a wide variety of sources to form our conclusive opinion on the 2010 BMW X6. We also drove the BMW X6 and X6 M to offer firsthand insight on the widely differing opinions found in those sources. Our time behind the wheel also helps us to explain features and aspects other reviewers might have missed-and to put in the tie-breaking vote where reviewers didn't agree. The 2010 BMW X6 is a bit of an oddball, its coupelike profile belying its SUV-like dimensions. The overall shape is aerodynamic and flowing above the shoulder line, but below, its bulk throws it off-balance. Reviewers tend to love or loathe the 2010 X6's styling, whether it's the plain-vanilla version or the more aggressively styled X6 M. Interior design and styling are modern and attractive, though some may find the X6 M's addition of carbon fiber-look panels a bit much. The 2010 BMW X6 comes in three versions: the XDrive 35i, propelled by a 306-horsepower 3.0-liter twin-turbocharged inline-six; the XDrive 50i with a 400-horsepower, 4.4-liter twin-turbocharged V-8; and the new-for-2010 BMW X6 M, featuring a brawny 555-horsepower version of the 4.4-liter twin-turbocharged V-8. The only transmission available is a slick and stout six-speed automatic. Inside, the X6 is a comfortable refuge from the daily grind-for front-seat passengers anyway. The rear seats are a bit short on headroom due to the slope of the roof, and while legroom is good, the rear seat arrangement means only four adults will fit comfortably. Materials and quality of the interior are up to BMW's typically high standards, with close tolerances between parts and a solid feel throughout. Noise isn't a major concern, though the large side mirrors do make their presence known at highway speed; tire thrum is present as well. Visibility is something of an issue due to the narrow rear glass. Ever known for its high-tech innovations, BMW doesn't skimp on safety features for the X6. With a full complement of front, side, and curtain airbags, plus a range of stability and performance-tuned traction control, the X6 provides both the protection you need and the confidence you want behind the wheel. The 2010 BMW X6 also has an ample list of standard features, including 10-way power-adjustable seating for driver and front passenger, HD Radio, wood-grain trim, automatic front climate control, push-button start/stop, power tailgate, front and rear parking sensors, a 10-speaker stereo with two subwoofers, dynamic cruise control, and more. 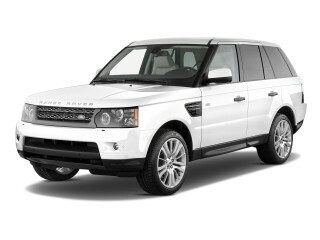 Optional upgrades include four-zone automatic climate control, ventilated front seats, iPod and USB connectivity, a premium hi-fi stereo system, six-disc DVD changer, voice command, navigation, real-time traffic, a rearview camera, and a range of interior and exterior appearance packages. The 2010 BMW X6's dual-purpose design is controversial, with the question of its beauty (or lack thereof) still unsettled. The 2010 BMW X6 is a bit of an oddball, its coupelike profile belying its SUV-like dimensions. The overall shape is aerodynamic and flowing above the shoulder line, but below, its bulk throws it off-balance. Reviewers tend to love or loathe the 2010 X6's styling, whether it's the plain-vanilla version or the more aggressive-looking X6 M. Interior design and styling are modern and attractive, though some may find the X6 M's addition of carbon fiber-look panels a bit much. It's not surprising that the 2010 X6, conceptually still relatively new in the automotive world, has many reviewers at a loss for accurate descriptors. Car and Driver asks, "Is the X6 beautiful? Ground breaking? Fashionable? 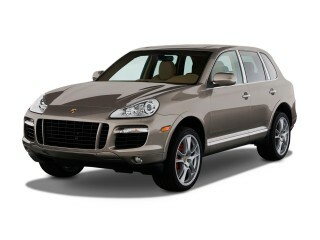 Or does it come across as a lifted five-door hatchback?" They seem to answer their own questions, saying, "At least when you're driving the X6, you don't have to look at it. And after driving the X6, it's likely that the styling will be forgotten or, at the very least, forgiven." Jalopnik says "its looks are promising yet flawed," and calls the rear end "huge"-while Edmunds ogles the X6, deeming it "kind of a supermodel from behind." In addition, "The front is all BMW with a big twin kidney grille and fighter-jet-size intakes at each corner," according to Edmunds. "The roof line goes on forever in profile, giving the X6 a hatchback-style look that's unique at best, a little too forced at worst." The Edmunds team does give it a small reprieve, noting it "isn't nearly as warped when you see it in person." Popular Mechanics finds the look decidedly masculine: "we think it's positively dripping with machismo." Jalopnik notes, "that lip on the rear hatch is taller than an F-150's tailgate." The 2010 BMW X6's sloping roof might find more acceptance with sports car fans. Truck Trend says, "BMW designer Adrian van Hooydonk claims [it] is cribbed from the 6 Series." The top two-thirds of the 2010 BMW X6 is all sports coupe; the bottom one-third is SUV. More traditional design awaits inside the 2010 BMW X6. Here the dash shows some resemblance to the X5, with the BMW iDrive taking center stage, flanked by dark trim and numerous other controls. TheCarConnection.com notes that the high-mounted center console gives a tighter, closer feel to the cockpit than you might expect from a large vehicle. A beefy V-8 engine and a smooth inline-six give the 2010 BMW X6 serious performance chops, and the X6 M takes it to near-sports car levels-but it's still a big, heavy SUV. 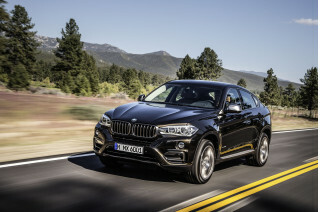 Reviews researched by TheCarConnection.com find the BMW X6's power and handling to be good not just for an SUV, but surprisingly good, period. The 2010 BMW X6 comes in three versions: the XDrive 35i, propelled by a 306-horsepower 3.0-liter twin-turbocharged inline-six; the XDrive 50i with a 400-horsepower, 4.4-liter twin-turbocharged V-8; and the new-for-2010 BMW X6 M, featuring a brawny 555-horsepower version of the 4.4-liter twin-turbocharged V-8. The only transmission available is a slick and stout six-speed automatic. Jalopnik prefers the V-6, despite the fact that, "on paper, the V-8 is the clear winner, delivering a 0-60 time of 5.4 seconds and a top speed of 155 mph. In practice however, the inline-six is livelier, weighing down the X6's front end considerably less and not suffering from the bigger engine's turbo lag. At 6.5 seconds to 60 mph and topping out at 149 mph, it's far from slow as well." Edmunds leans toward the standard V-8 because it "sounds more like a carbureted big block than a sophisticated twin-turbo engine with direct injection." Despite the V-8 preference, Edmunds thinks the claimed 0-60 time for the V-8 is too optimistic, since the figure "is only 0.3 second slower than the last [BMW] 135i we tested, and the tiny coupe weighs 1,906 pounds less." The X6 M, on the other hand, even at 5,324 pounds, is "more than capable" of the BMW-claimed "0 to 60 mph run of 4.5 seconds" says Autoblog. The automatic transmission has both fans and foes. Car and Driver has "no complaints" about the transmission, and Popular Mechanics calls it a "fast-shifting six-speed automatic with shifter paddles on the steering wheel." Edmunds, on the other hand, finds "the six-speed automatic transmission shifts tentatively, as if it's worried that unleashing too much force at one time might eat a driveshaft or two." In the X6 M application, Autoblog declares "the transmission is excellent," praising the paddle shifter layout as "easily snatched for passing power on demand." Motor Trend likes the shift action, but says, "One thing we'd like to see BMW add is shift lights." The 2010 BMW X6 "isn't great on a racetrack," Jalopnik remarks, but Edmunds disagrees, calling it "shockingly agile," with "quick steering" and "little body roll." Car and Driver concurs: "for something this big and heavy, the X6 has amazing turn-in and grip, and the brakes never overheated." The X6 M is the track-day toy of the lineup; however, Autoblog finds "the X6 M's natural tendency is towards understeer." BMW's Dynamic Performance Control deserves a lot of the credit for the good handling traits according to most reviews. DPC, which is a version of four-wheel drive with integral stability control, uses electronics to send power to different wheels to maximize stability. "It makes the X6 handle incredibly well and incredibly safely in any condition without cutting power or hitting the brakes to interfere," says Jalopnik. Truck Trend contends "fancy electronics can't overcome the laws of physics," though. In the X6 M, "with M Dynamic Mode (MDM) engaged, the ghosts in the machine allow for a limited amount of rear slip," but the real fun is to be had when you "defeat the traction control completely" enabling the X6 M to reach slip angles that induce "cackling like a demented five-year-old with a gross of firecrackers." The 2010 BMW X6 isn't as roomy as the X5, but it's enough for most and well-made throughout. The 2010 BMW X6 makes a calculated trade of space for styling, but comfort and quality never take a backseat. Inside, the X6 is a comfortable refuge from the daily grind-for front-seat passengers anyway. The rear seats are a bit short on headroom due to the slope of the roof, and while legroom is good, the rear seat arrangement means only four adults will fit. Materials and quality of the interior are up to BMW's typically high standards, with close tolerances between parts and a solid feel throughout. Noise isn't a major concern, though the large side mirrors do make their presence known at highway speed, and tire thrum is present as well. Visibility is something of an issue due to the narrow rear glass. Car and Driver says it's "quite roomy inside" the 2010 X6, and Jalopnik finds ample room in the "incredibly spacious interior." "The driving position is much more carlike" than a typical SUV, Motor Trend observes, adding, "The M sport seats hold you comfortably and give you plenty of support when you hit the track." Edmunds has no complaints: "Up front, we don't notice a thing." The back offers only two bucket seats that are "far more comfortable" than a typical bench, but the sloping roof means two fewer inches of headroom than in the BMW X5. Beyond space issues, the 2010 BMW X6's shape can cause some problems with sight lines. "The svelte shape leaves plenty of room for six footers in the rear seats, but doesn't allow for rear visibility," warns Jalopnik. 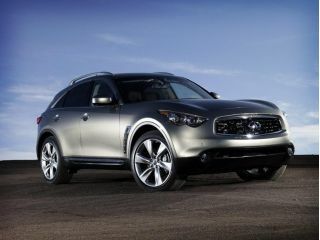 Augmenting large side mirrors, the optional rearview camera's a must-have, they comment, and Car and Driver agrees. As Edmunds points out, the X6 has 59.7 cubic feet of cargo space with the second-row seats tucked out of the way, but the X5 adds 25 percent more room for a total of 75 cubic feet. Popular Mechanics says, "in terms of practical room for gear, the X6 is limited." Motor Trend sees the bright side, noting "under-floor storage similar to the X5's." Interior quality of the X6 is widely praised in web reviews, and it improves in the X6 M. Truck Trend likes the quiet ride of the "X6's largely sound proof, leather-trimmed cabin." Car and Driver lauds the "identical interior to the X5, except for the incredibly tacky knee pads added for driver and passenger, supposedly to encourage sporty driving." Even the doors get high praise, with Car and Driver pointing out the "X6's soft-close doors [a $600 option] are what separate aspirational luxury cars from true luxury cars." The 2010 BMW X6 hasn't been crash-tested yet, but it is chock-full of cutting-edge safety equipment. Though it's been on the market for a full model year, the BMW X6 still hasn't been crash tested by the National Highway Traffic Safety Administration (NHTSA) or the Insurance Institute for Highway Safety (IIHS). Since it's structurally similar to the BMW X5, which gets mostly five-star crash scores from NHTSA and is a Top Safety Pick over at the IIHS, the X6 may perform well too. On the other hand, the different roofline could significantly affect results, so test scores cannot be simply carried over to the 2010 X6. Safety features aren't lacking, as the 2010 BMW X6 comes standard with front, side, and curtain airbags; anti-lock brakes; and traction and stability control. The X6 M adds to the package with a performance-minded M Dynamic mode that allows for higher slip angles while still maintaining safety. BMW stability control takes advantage of the 2010 X6's four-wheel-drive system through Dynamic Performance Control. The ability to send power to individual wheels lets the BMW X6 have more direct impact on safety than stability control alone can. As Car and Driver puts it, "DPC weighs an additional 26 pounds, and we found it to be worth every ounce." Popular Mechanics feels that "in fast corners with abrupt steering maneuvers or when the driver suddenly lifts off the gas pedal, DPC simply improves stability." The M Dynamic mode does the same, but allows a little more driver aggression for on-track fun. The 2010 BMW X6 can be as luxurious-and as expensive-as you want it to be. The 2010 BMW X6 also has an ample list of standard features, including 10-way power-adjustable seating for driver and front passenger, HD Radio, wood-grain trim, automatic front climate control, push-button start/stop, power tailgate, front and rear parking sensors, a 10-speaker stereo with two subwoofers, dynamic cruise control and more. 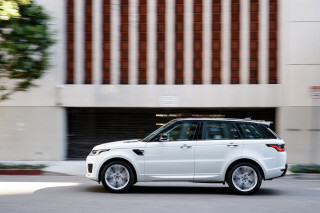 Optional upgrades include four-zone automatic climate control, ventilated front seats, iPod and USB connectivity, a premium hi-fi stereo system, six-disc DVD changer, voice command, navigation, real-time traffic, a rearview camera, and a range of interior and exterior appearance packages. "The X6 also comes with every other conceivable kind of gizmo, which while impressive, would make us worry about buying an X6 as a used car in a few years' time," Jalopnik warns. On the other hand, if you opt for the X6 M, Autoblog says you can rest assured you're driving "one of the most formidable, meticulously engineered, tech-rich crossovers on the planet." A high-end audio system, a navigation system, Bluetooth wireless connectivity, and a range of wood trim make for a very configurable buying experience. "There's even a heater for the [steering] wheel if you desire," Truck Trend says, and in between the rear seats, there's a "handy console for drinks and gear." The X6 M model doesn't add a lot of gadgetry-and it doesn't need to, instead focusing on the performance side of the equation. Car and Driver points out the 2010 X6's base price of about $56,000 for the six-cylinder X6 and $66,000 for the V-8 version, while the new X6 M joins the party with a starting price just under $90,000. 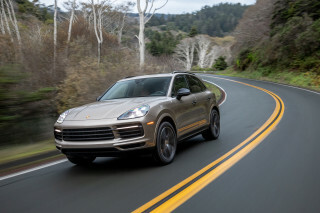 The price rises quickly when you start adding Sport packages, navigation systems, and top-line stereos; even the lesser version can top $70,000, notes Car and Driver. "Plan on $80,000 for one with all the goodies," they add. The X6 M's price seems even tougher to swallow, but it still "undercuts the Porsche Cayenne Turbo by a considerable margin," says Autoblog. Edmunds isn't so sure about the price either, asking whether the X6 is worth the premium over its X5 sibling: "An extra $8 grand for a little more motor, fewer seats with less room and an all-wheel-drive system you'll hardly ever know is there?" Audio, climate, and navigation systems are all handled through BMW's capable but oft-criticized iDrive system. Most of the reviews TheCarConnection.com sampled call out the iDrive's complexity, but one review finds it has improved. "The iDrive is better than ever as well," Jalopnik argues. "Spend a few minutes getting used to it and you'll be rewarded with rapid, intuitive access to all the vehicle's settings." Make sure you get 4L one , dont even look at 3L you will not enjoy it due to single turbo .